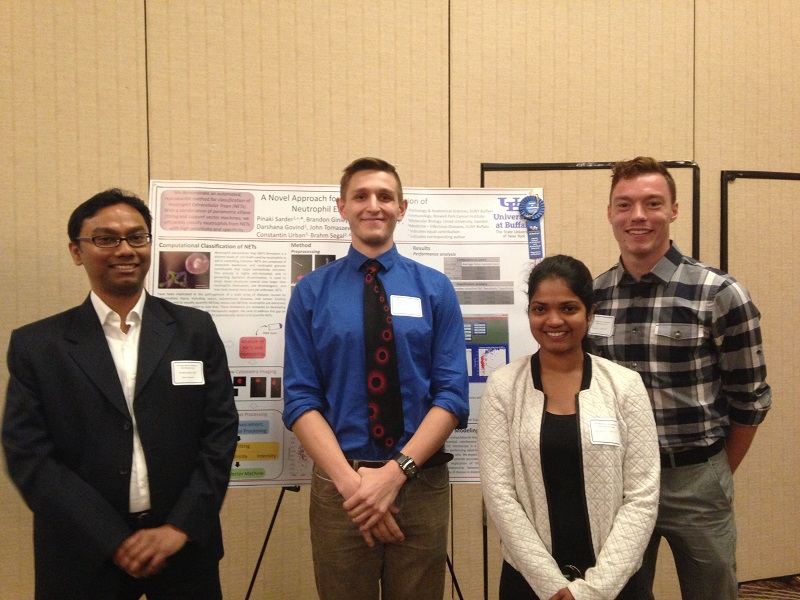 Group photo on UB DOM Research Day; June 4, 2016, Buffalo, New York, USA. 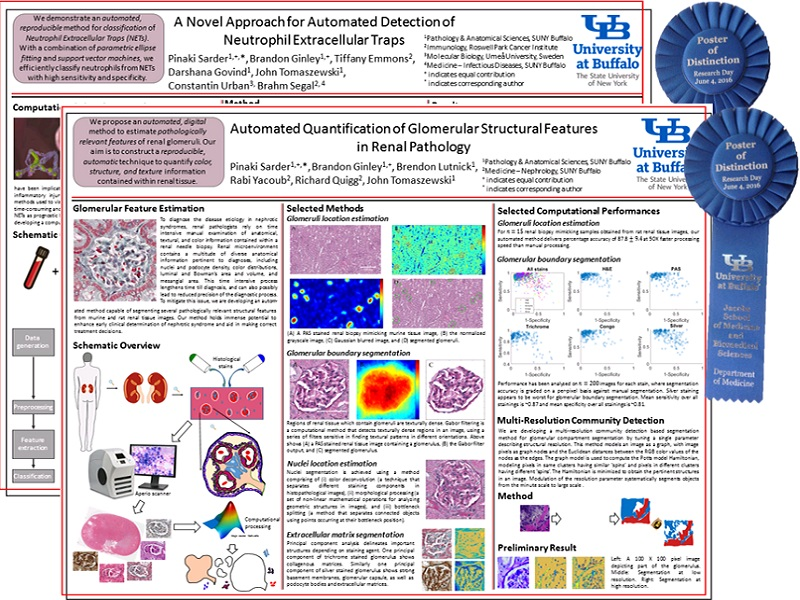 Our posters were rated by the reviewers with distinction; June 4, 2016, Buffalo, New York, USA. 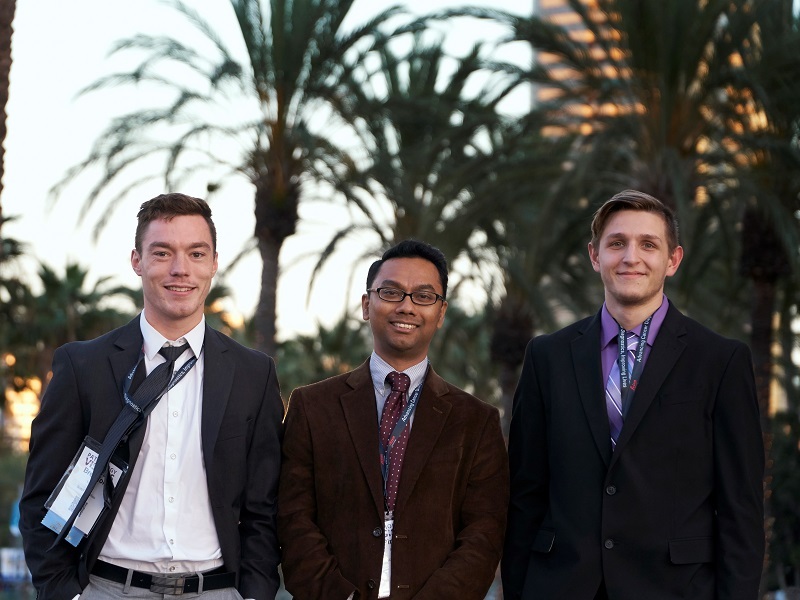 Brandon presenting his work on image analysis of neutrophil extracellular traps; February 13, 2017, Orlando, Florida, USA. Brandon presenting his work on segmentation of glomeruli from renal tissue images; February 13, 2017, Orlando, Florida, USA. Brendon presenting his work on Potts model optimization for large scale data analytics; February 13, 2017, Orlando, Florida, USA. With Dr. Tim Murphy (Director, UB Clinical and Translational Science Institute) and Dr. Margarita Dubocovich (SUNY Distinguished Professor); April 19, 2017, Washington, D.C., USA. 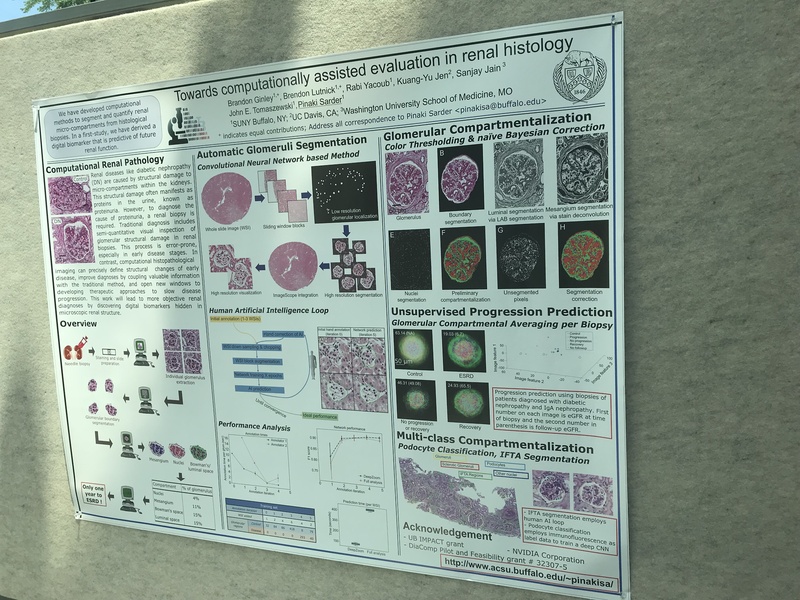 Brandon presenting his work on computational analysis of the structural progression of human glomeruli in diabetic nephropathy; February 11, 2018, Houston, Texas, USA. Brendon presenting his work on cross-species knowledge transfer in image analytics; February 11, 2018, Houston, Texas, USA. Olivier presenting his work on examining structural changes in diabetic nephropathy using inter-nuclear distances in glomeruli; February 11, 2018, Houston, Texas, USA. Darshana presenting her work on unsupervised glomerular segmentation using immunofluorescence microscopy imaging; February 12, 2018, Houston, Texas, USA. St. Louis visit; March 19, 2018. 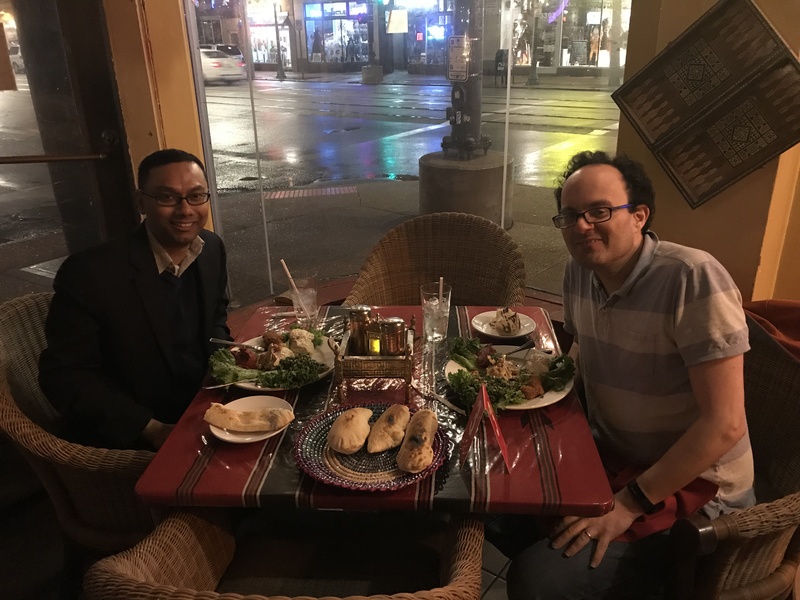 Dinner with Prof. Zohar Nussinov (Physics, Washington University in St. Louis). Presentation of the group's work at NIH; July 12, 2018, Washington, D.C., USA. 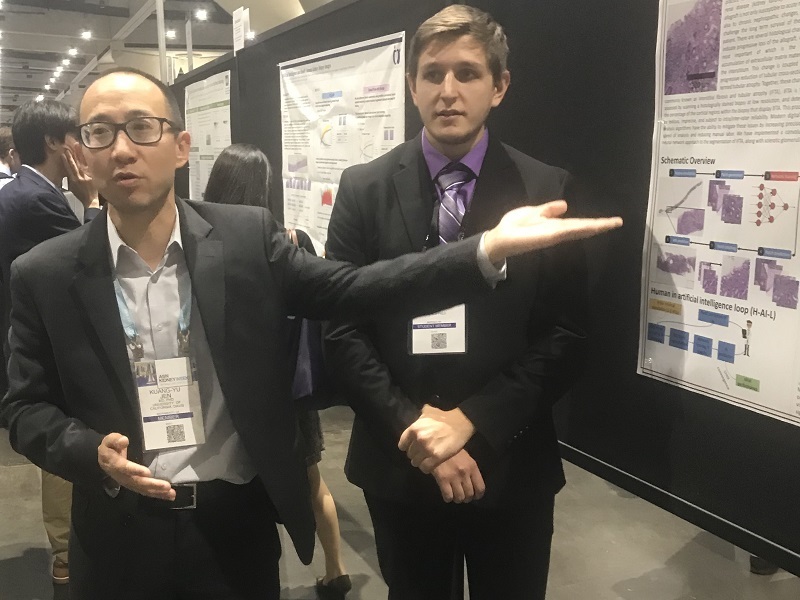 Dr. Kuang-Yu Jen and Brandon Ginley are presenting our work on IFTA segmentation from digital whole slide images of renal transplant biopsies; October 27, 2018, San Diego, California, USA. 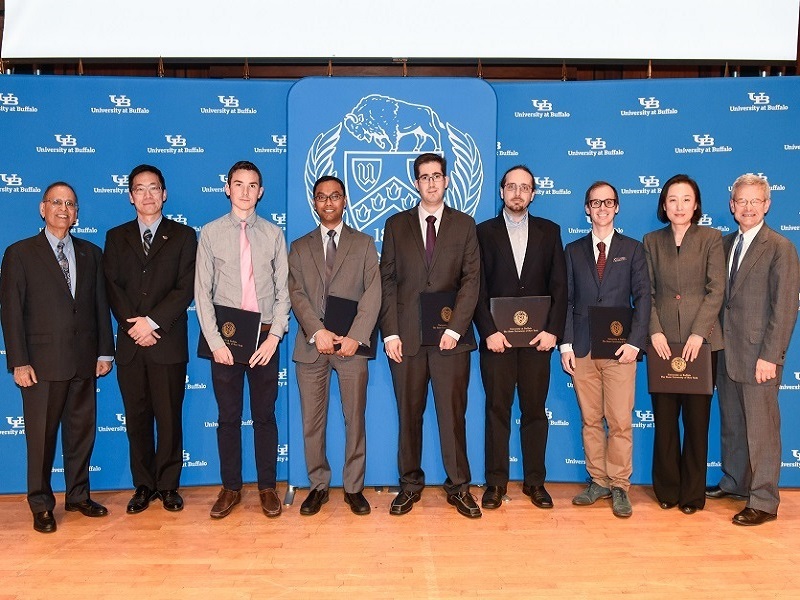 Photo with other Exceptional Scholars - Young Investigator Award Recipients and UB President and Provost; November 1, 2018, Buffalo, New York, USA.